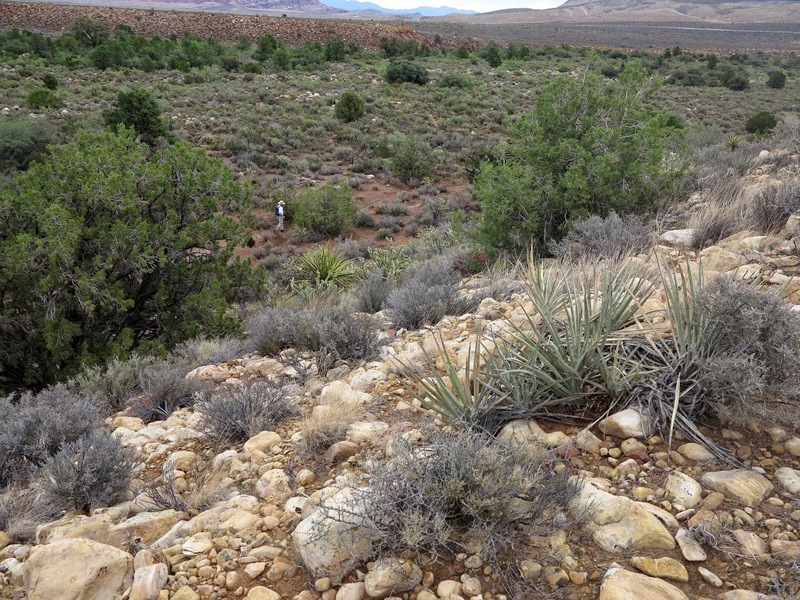 Chances are pretty good that your first hike in Red Rock Canyon was at Lost Creek. Well, this month we’re going to “kick it up a notch” and explore a trio of trails in this beautiful area. Your first stop however, should be at the visitors’ center to pick up your free copy of the Children’s Discovery Trail guide. Then, load up Aunt Edna and the kids in the mini-van and drive about seven miles around the loop until you find the Willow Springs turnoff and the Lost Creek parking lot. The half-mile Children’s Discovery Trail that loops through this canyon is very diverse and accessible. You’ll also find that this is an incredibly popular area, but don’t let the crowds deter you from enjoying the rich experiences that lie just ahead. No special hiking gear is required for this easy walk, but remember, you are in the desert and each person should carry a bottle of water. OK, grab your trail guide and head out into the wash. This is “hiking by the numbers” and you’ll be looking for guidepost #1. Even though this trail is rated “G” and is suitable for all ages, there is still plenty of good stuff for grown-ups, too. See if you can identify some of the plants and wildlife that are illustrated in the trail guide, and be sure to read the helpful interpretive signs that are posted along the way. You’ll want to follow the “Lost Creek Route” near guidepost #5 that winds through a picturesque little grotto complete with a wooden park bench shaded by a huge Ponderosa pine tree. The path continues through a rock “tunnel” that takes you into a box canyon with a seasonal waterfall. If you’re careful, you can hike around behind the waterfall and then back down to the rock tunnel. Once you’re back on the main trail you’ll find yourself at guidepost #6 and entering the new boardwalk. This structure was recently built to protect the fragile riparian area around Lost Creek, which incidentally is home to two very rare freshwater snails that are only found here in the Spring Mountain range! This new boardwalk actually blocks access to the area described by guidepost #7, so please respect this restriction and don’t try to go around the fences. Unfortunately, all of Lost Creek has been loved to death, and is now struggling to recover. The scenery in Lost Creek and Willow Springs is spectacular. I can only imagine what this place might have been like hundreds of years ago, before airplanes and SUV’s, before boom boxes and spray paint. It was probably as sweet and serene as anywhere on earth. Travel across time now. Pull up a rock along the trail, close your eyes, and fill your lungs with the sage and juniper scented air. Life is good here, no wonder it’s a popular place! Experience Lost Creek and have a very enjoyable day with family and friends. The hiking is pleasant and really not challenging at all. I would give the Lost Creek / Willow Springs experience a total score of five boots out of ten. Have you ever wished that you could go back in time and hike a beautiful trail at Red Rock before anyone else found out about it? Well, keep reading and I’ll let you in on a “secret” trail. But first we must explore the famous “Caves Trail”. One mile past the Red Rock entrance on Hwy 159 is a small parking lot for horseback riding and BLM day use. Park there, grab your hat, water and camera and hike up the hill toward the horse stables. The trail turns into a dirt road as you approach the horses and you can follow the road to tip your hat to the cowboys or drop down into the wash and go around the stable if you prefer. As you continue over the culvert and along the hill you’ll notice a distinct black mountain directly ahead of you. This is an important landmark so be sure to make a mental note of it. You might see a (faux) cave entrance high on your left crowned with colorful graffiti, and you may be tempted to climb up there to check it out. Don’t. Except for some broken middens it’s not worth it; save your energy for better things. About ½ mile from the parking lot you will come to a rough staircase. Put your legs in four-wheel drive and start climbing… there are 102 wooden steps. There used to be 103 but for a recent “campfire”. Once you get to the top, turn around and enjoy the unique view of Red Rock while you catch your breath (Kodak moment). Just beyond this point is a large grouping of rocks, which used to have a terrific pictograph of Bart Simpson until some energetic volunteers attempted to clean this place up. The main cave entrance is near the base of these rocks. Native Americans were not spelunkers because they didn’t see any reason to go down into the underworld. I personally tend to agree. But if you’re determined to explore this cave (and there are several levels down there), you’ll need to crawl in with flashlights. BLM officials have told me that this cave has been completely destroyed by vandals at every level. A little farther up the trail is the largest “cave” opening (and the scene of the campfire) as well as more graffiti and numerous beer bottles. Be sure to look up toward the top of this opening, and you’ll see a huge pack rat midden securely keeping its important historical records against all odds. If you decide to keep hiking around to the east wall there are some nice petrified tree stumps and other fossils to be discovered in the limestone. Remember the mental landmark? Scoot back down the hill until you’re standing in front of the black mountain. Look carefully; you’ll see another little trail going to the west around the mountain. Shhh… this is the secret trail. Follow it into the magnificent ravines of Blue Diamond Hill. This is a wonderful hike with lots of birds and perfect little cactus gardens. There is no graffiti, no litter, and no people! I can’t wait to go back. There is some moderate rock scrambling required but it’s oh, so worth it. Just remember, don’t tell anyone about our secret seven-boot trail! They were the wrong shoes. I really didn’t intend to hike to the Calico Tank on this particular day, so I wasn’t wearing my hundred-dollar, high-tech, waterproof, ankle-hugging hiking boots. Nope, I was just standing there in my old scruffy Reeboks and official BLM volunteer wear, inspecting some fresh graffiti near the Sandstone Quarry parking lot, when a nice couple visiting from the Twin Cities struck up a conversation. They were both teachers and keenly interested in everything Red Rock. The old hike leader instinct fired up and I started telling them the whole story beginning with the ancient sand dunes and ending with the modern graffiti we were standing on. From the parking lot we walked a short distance to the old sandstone quarry to see a big pile of 10-ton blocks that were quarried here in the early 1900’s. There are beautiful red and white sandstone mountains, scented green pines and hardy desert oak surrounding the quarry. I discovered that this is really an excellent place to bring first time visitors because it’s easy to access, the scenery is gorgeous, the rocks are fun to climb and there is an abundance of horticultural, historical and cultural areas of interest. The Sandstone Quarry offers a terrific interpretive opportunity for a long-winded desert rat like me. Of course I had to show my new friends the “prehistoric kitchen”, which is just northwest of the quarry. This is a well preserved agave roasting pit used centuries ago by the Native Americans. I explained how the large bowl-shaped pit was similar to the natural Tinaja’s (water tanks) in the Calico Hills just one mile to the east… and up a little bit. I did have plenty of water with me, so I thought it would be nice to lead them along the Calico Tank trail, which begins in the wash and heads east along a pine tree lined path directly into the heart of the Calico’s. After all, I didn’t want them to get lost! This portion of the trail is well marked and incredibly beautiful with constantly changing colors and textures. The gravel path gives way to white sand, which eventually becomes red sand and finally leads to the deep red stones that serve as steps up to the tanks. If you were wearing the wrong shoes like me, this would be a pretty good spot to turn around, unless you were being encouraged by a couple of insatiable mid-westerners to “get to the tank”. It probably didn’t help that I had told them about a particularly nice petroglyph “up there”. From this point on, the navigation of the hike can be a little tricky, but that’s a big part of the fun. If you take some time and use your best route-finding skills, you’ll be able to follow carefully crafted stone steps all the way to the top. If you happen to miss the “official” trail, it’s easy enough to pick your way along the sandstone toward the top of the hill. You’ll eventually wind up back on the proper route. 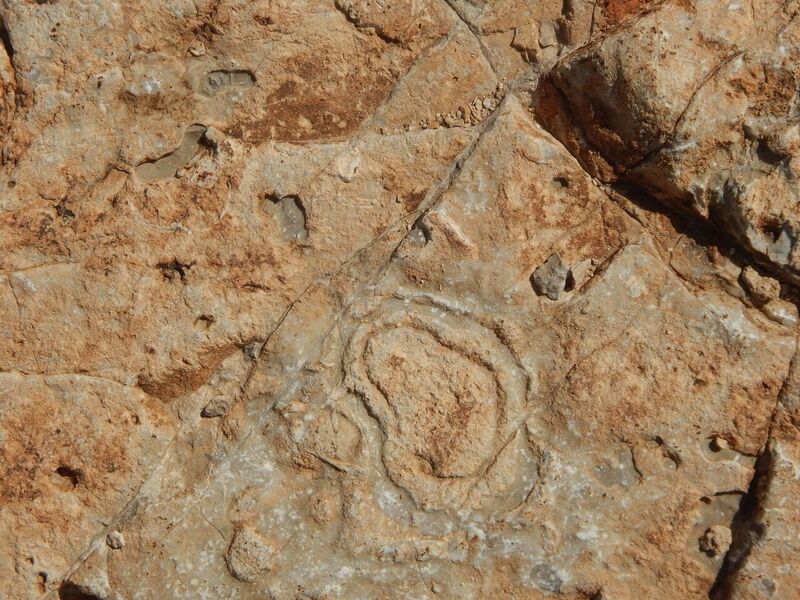 Keep a sharp eye on the north wall about halfway to the top and you might spot the “sun” petroglyph. There’s something about a petroglyph that is magical to me. When I stop and study one, I always imagine the ancient artist standing in the same spot. He reaches out over time and space to look directly at me, and I just stand there looking back. The persistent steps that are beginning to feel like a StairMaster workout, take you past the “Holiday Wall”. This is a shear and overhanging rock formation that is popular with the “ropes & bolts” set. You’ll know it by the various chalk marks all over its face. Lacing my sneakers up nice and tight, I lead my “group” on the final push toward the summit. Once at the top, the trail drops sharply down into a huge tinaja, which can be full of water, so enter and explore this area with caution. Alternatively, there is a high, wide shelf just above you and to the south that provides an easy walk to an overlook of Red Springs and the entire Las Vegas valley. This might be the perfect spot for a backpack picnic; plenty of room to stretch out, a great view, Turtlehead Peak looming overhead, and the knowledge that it’s all downhill from here! 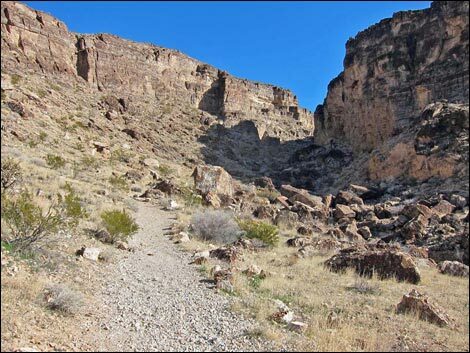 I love the Calico Tank trail and hike here often in spite of the 15% to 20% grades. You don’t even need your fancy boots to do it. In fact, I have good information that the Native Americans came up here wearing only moccasins. This is a great outing and fully deserves a seven-boot (or seven-sneaker) rating! Pop a cork and pour champagne on this issue of The Desert Trumpet to welcome “Boot Tracks”, a monthly look at trails in and around Red Rock Canyon. This month’s subject, The Arnight Loop Trail is really comprised of the Arnight Trail, the Knoll Trail and the North Oak Creek Canyon Trail. Finding the trail head is easy; just drive about twelve miles around the loop, then take that last bumpy dirt road on the right marked Oak Creek Canyon, and follow it to the parking area. The Arnight trail head is to the north and is well marked. The sign gives this route a difficulty rating of “moderate”, although it’s really somewhat easier than that. It reminds me of the Children’s Discovery Trail, only longer. The Arnight Trail is built for two, plenty wide with a natural tread that’s not too rocky. There are some nice sandy washes and the grade is an easy 7% so you’ll hardly break a sweat over its 1.6-mile length. The second and longest leg is the Knoll Trail, which is probably more deserving of the “moderate” rating. The path narrows and is rockier with some grades to 15%. I would still recommend it even to beginning hikers because the trail winds through some heavy vegetation and deeper washes to top out around 300 feet above the parking area. The panoramic view from the top of the rock staircase is really nice and makes a good photo spot. Total length of The Knoll Trail is marked as 1.9 miles. The last leg of this loop is the North Oak Creek Canyon Trail. If you feel like taking a little side trip, turn right (west) and hike into Oak Creek Canyon; it’s stunningly beautiful. Otherwise turn left for a quick one-mile descent down the old rocky jeep trail back to the parking lot. The Arnight Loop Trail is one of those wonderful garden areas at Red Rock. At every turn there are new and more beautiful groupings of rocks and cacti. A plethora of Mojave Desert plants are represented along this path. Be sure to allow enough time to enjoy the walk and take in the quiet beauty. Since there isn’t much shelter on this trail, I recommend that you go early in the day, wear a hat, take your camera and of course lots of water. I like the Arnight Loop Trail. While it doesn’t have the jaw dropping beauty of Ice Box Canyon or the sporty fun of the Calico Tank, it does provide a fairly easy and very interesting morning stroll through the desert. I would give it a rating of five boots (out of ten). Heading out for a remote adventure? No cell coverage? No problem. The BLM has developed georeferenced maps compatible with any georeferenced map mobile application. These PDF maps are designed for use on your GPS-enabled mobile device and can be displayed on any PDF reader. When viewed in an installed mobile map application, each map is designed so that your location can be displayed on screen in real time. Georeferenced map applications allow you to navigate using your mobile device’s GPS even without cellular reception. There are a variety of georeferenced PDF apps available for Apple and Android devices. Consult the mobile apps instructions for complete information on how to use. The BLM has currently uploaded several georeferenced maps to the AVENZA application store. These maps can also be printed or viewed without using a mobile application. Ensure Location Services is enabled for the mobile map application being used on your mobile device. In areas with no cellular reception, phone battery life significantly decreases. Utilizing airplane mode or putting your device in airplane mode will greatly improve battery life and will not interfere with GPS tracking. Like all GPS technology, the accuracy of your device will be compromised by cloudy weather and close proximity to tall cliff walls and slot canyons. File sizes for maps obtained from the AVENZA app store are typically much larger than the PDFs listed below. AVENZA recommends users connect to a WiFi network when downloading. 1 Should have slept in today. You would rather go to the dentist. Give it the boot. 2 Boring, dull, noisy, polluted, trashed. You’ll need a REAL good reason to be out here. 3 Flawed trail but has some redeeming characteristics. Can hike here if desperate. 4 Interesting trail with some annoying problems. Not a bad trek. 5 Good basic trail. You like it and it deserves the “C”. You will probably hike this again. 6 A really good hike that’s more challenging and beautiful than average. 7 You love this one. You want to bring all of your friends and share it with them. 8 Simply awesome trail. You would travel far to do this one and it is a very memorable experience. 9 World-class, nearly perfect experience. This trail will turn you into a poet. You’ll tell everyone you meet about this. 10 Possible life-changing experience. This will make you sit in quiet contemplation and thank Mother Earth for giving you this moment in time. You won’t tell anyone about this place, it’s too personal. Click here to view new BLM trail maps. Potato Knoll is a hike of about 4.5 miles round trip. It’s not a standard out-and-back hike but one that goes to the base of the Potato Knoll, loops around the knoll, and then returns on the same trail to the parking area. There are a couple of ways to do this hike. The best way is to park along SR 159 at the first dirt parking area past the exit from the Scenic Drive (about ¼ mile past the exit). The trail heads toward the knoll — the Potato Knoll that is sometimes called Wilson’s Pimple. The first part of the hike is on an old road. About ¾ of a mile out as you head toward Oak Creek, the trail forks to the left. Follow this fork as you hike across the fl at part of this area and then down some steps that bring you to Oak Creek. There may be water depending on the time of year. After crossing the creek, the trail continues until you come to a large juniper tree where the trail meets another one. Follow the trail to the right and it will bring you around to an area where you’ll have some elevation gain and some rocky going. Along this part, you’ll pass the remnants of a wooden sled that was used to haul sandstone out of the area when there was a quarrying operation here. A little later, you’ll pass some petrified wood off the trail on your right side at the crest of this uphill section. For the next part of the hike, you’ll be going along the base of the knoll and the terrain is flat. Colorful Characters of Red Rock Canyon. When you reach the high point on this side of the knoll, you’re at a place that’s good to take a break and have a snack. In front of you is a view of Oak Creek Canyon and the area has a lot of juniper and some pine. Continuing on the trail, you’ll see it fork to the right. Take that right turn and follow it and you’ll join a trail that comes from Oak Creek. Stay to your right and keep going around the knoll. You will cross Oak Creek two or three times. This part of the creek is more likely to have water in the spring. After another mile or so, you come back to that juniper tree you saw when you came to the trail junctions. Turn left here and this will bring you back to the old road where you make a right and head back to your car. This is a cooler weather hike with some shade at the snack area. Remember to take enough water. Hiking boots are best for this trail although I’ve seen people hike it in sneakers. One of the bonuses of this hike is you don’t have to drive the Scenic Drive after you’re done to get back to Las Vegas. It’s also a less used trail and you’re not as likely to see many other people. 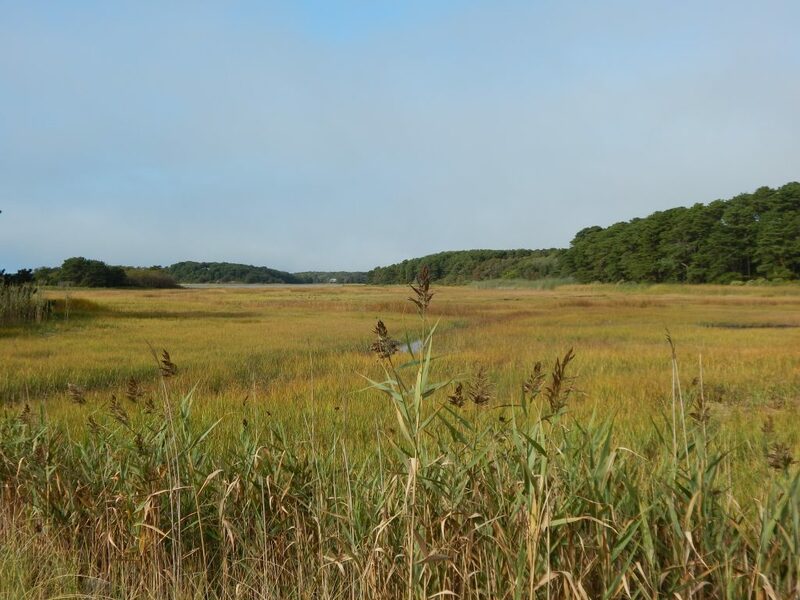 The marsh spreads miles from Cape Cod Bay revealing an ever-changing world from my back yard’s giant bay window. Twice every day by nature’s definition the tide ebbs and flows. During full moon, the water’s edge creeps closer – more so when the northeast wind reaches double-digit authority. From winter’s icy waves to summer’s high, undulating grasses, the marsh reveals a rhythm that is at once predictable and mysterious, its angles ever changed by the competition between sun and clouds, by the moon’s cycles, by shifting breezes. From the front of my home, I watch the same eternal tide command Boat Meadow beach. White caps may capture a moored sailboat’s bow, carrying it feet into the air. Five hours later, the sandy flats now stretch a quarter mile to the horizon, imposing a transient serenity and inviting me to walk toward the edge of the world. Six months ago, I departed the bay and marsh and moved to Las Vegas. Friends and family wondered aloud how I could abandon the sea; the early morning beach walks sharing soft sand with piping plovers and terns, spying the spray of right whales in the distance and feeling the curious stare of grey seals bobbing in the surf. Leaving the ocean for the Strip? The Red Rocks, I explained. There’s mystery and adventure there – a majesty as humbling as the sea. Like the marsh, their angles are commanded by the same sun and moon, by the hour of the day, by the direction of the wind. Stand on Fossil Ridge and stare toward a different horizon. At times, you can imagine the topography as waves – especially as clouds form at the edge of a ridge, casting shadows that bob and weave. Suddenly, there is a lone wild burro in the distance creating the same excitement that a dolphin can as it rises from the bay. 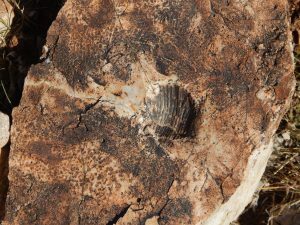 But, it’s the fossils themselves that connect the two seemingly disparate worlds, that impose on both brain and heart the knowledge of your own mortality and the immutability of nature. How can it be that descendants of scallops and sea sponges I discover along a lonely Cape Cod beach are encased and memorialized among the stepping stones of my quiet quest climbing these mighty rocks? How can this peak’s path be guided by remnants of the ocean’s floor, each fossil part of archaeological tapestry that mocks the transience of our daily headlines? Your imagination can’t quite scale the 300 million years when these fossils were alive at the bottom of another ocean filled with a glittering array of fish – even giant squid. You kneel to touch the scallop’s contours. It instantly conjures the recent memory of a just-opened scallop’s shell that washed onto what Thoreau dubbed The Great Beach, discovered just before hungry gulls would arrive for dinner. At this moment, I am walking on water, this ocean basin 2,800 miles from Cape Cod and hundreds of millions of years from its Paleozoic origins – before the deposit of limey sediments, before the earth’s crust started to rise from tectonic shifts, before marine shale and sandstone were deposited, before swamps became petrified, before shifting sand dunes lithified, cemented with calcium and iron. At the tip of Cape Cod, at one of its thinnest points, there’s a trail that begins amid a beach forest, then loops toward the ocean at Race Point. Along the way, you pass dunes reaching 100 feet or more toward the sky. You can hear crashing waves in the distance. Yet, standing beside the mountains of sand, you imagine yourself lost in a desert, your view of the world eclipsed in every direction by the hot sand reflecting a noon sun. What will become of these dunes? They likely will be swallowed by the rising ocean – too soon. Atop Fossil Ridge, I think about how only months ago my moments were circumscribed by waters shimmering green and blue. Now, the moments bow to resplendent Calico cliffs – each world equal in its uniqueness, each inviting another day’s discovery, a new journey at nature’s command. 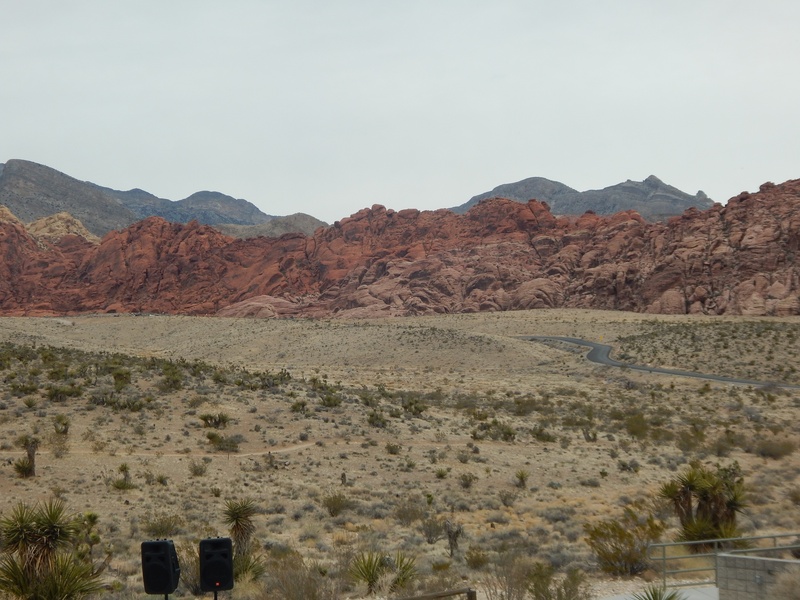 Thank you for your interest in applying for a transportation grant from Friends of Red Rock Canyon, Las Vegas. The Friends organization works closely with the Bureau of Land Management (BLM) to underwrite Clark County School District (CCSD) transportation costs for educational field trips. Or you can download our new Transportation Grant Guidelines and Fillable Application. 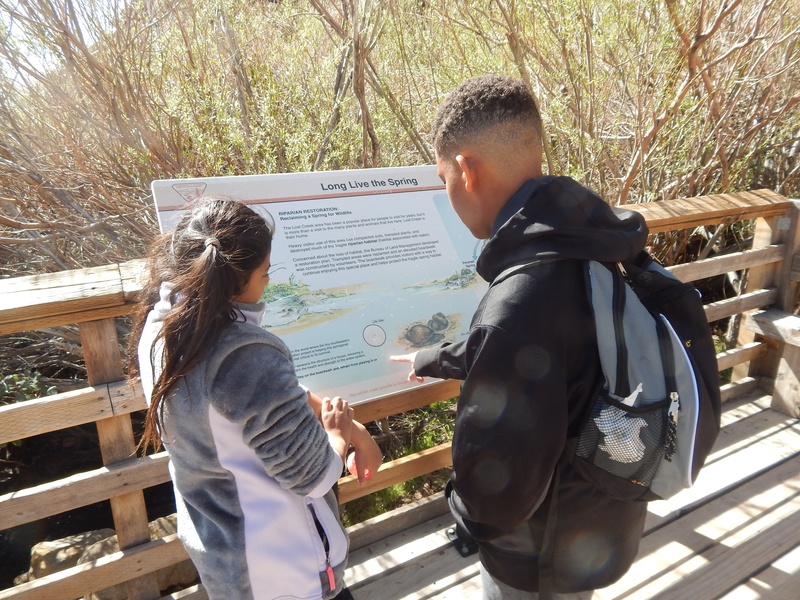 Completion of a BLM Sponsored Workshop is required as part of the Bus Grant program and to take students/groups on trails at Red Rock Canyon. You must complete one of these workshops and have your field trip scheduled and approved by the BLM before you are eligible to apply for a Bus Grant. Click on the links, below for more information about the workshops. Environmental Education Program Application Guidelines. Explore the Great Outdoors Workshop. Tentative 2017 dates are: September 2, October 14, and November 4. Biology at Red Rock Canyon. Tentative 2017 dates are: September 16, and October 28. 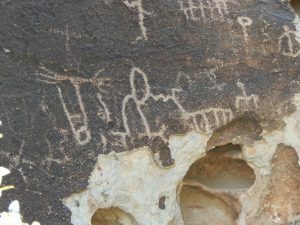 Archaeology at Red Rock Canyon. Tentative date is December 2, 2017. Environmental Education Program Procedures and Safety. We are working today… to protect tomorrow. In 1984, a group of enthusiastic people formed Friends of Red Rock Canyon. 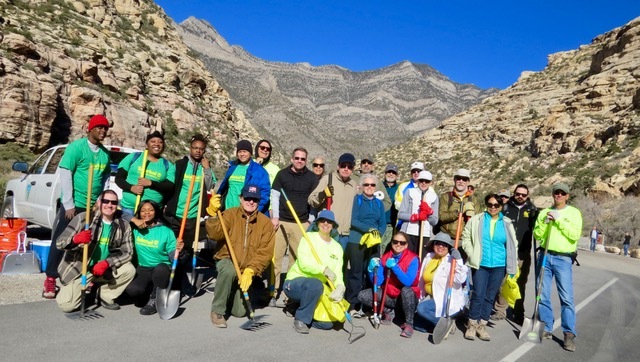 The original mission was to provide volunteers for Red Rock Canyon National Conservation Area. 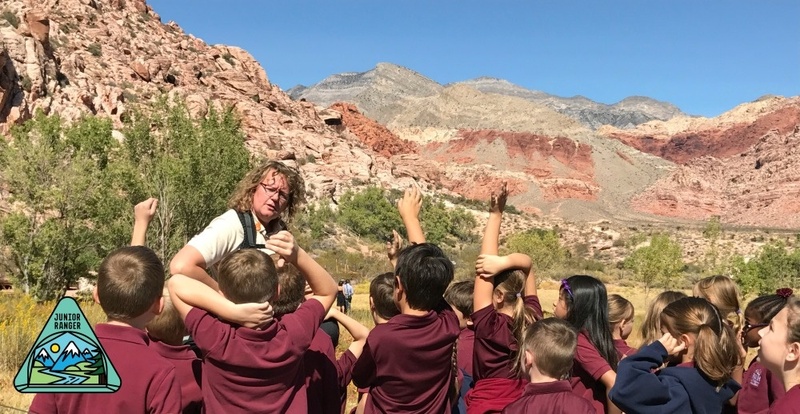 Friends of Red Rock Canyon, Las Vegas, Nevada, has since expanded our mission to provide not only critically needed volunteer assistance, but substantial financial support for education and environmental programs. During the past fiscal year Friends members donated over 21,000 volunteer hours and over $100,000 in direct support. Monthly e-newsletters and complimentary quarterly magazine, the Rock , to update members on news, programs, merchandise sales, and announcements. A 25% discount on regularly priced merchandise purchased at Elements, the Southern Nevada Conservancy Gift Store. A 25% discount on all purchases made from the Friends Red Web store. Receive free shipping/handling on purchases totaling $25.00 or more and being sent to one U. S. continental address. For orders less than $25.00, there is a $5.00 shipping/handling fee. See Friends’ merchandise by clicking on “Store” in this website. Members volunteering more than 40 hours each fiscal year are eligible for complimentary invitations to the Annual Volunteer Appreciation event. 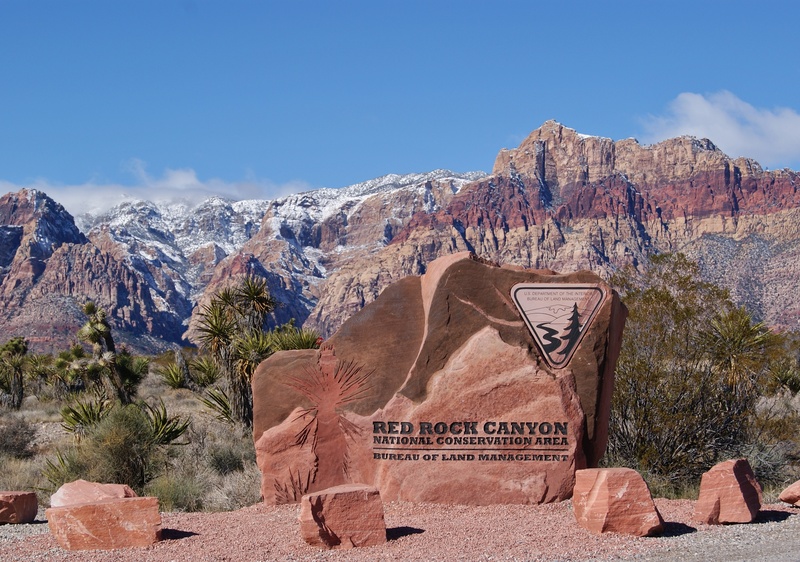 They will also receive recognition rewards from Friends of Red Rock Canyon as well as Annual or America the Beautiful passes from the Bureau of Land Management. Discounted entry fee of 20% for members who submit photographs for the Annual Red Rock Canyon Photo Contest. Opportunities for training classes such as First Aid and CPR at no cost. The satisfaction of knowing you are a participant in addressing the challenges facing Red Rock Canyon National Conservation Area. 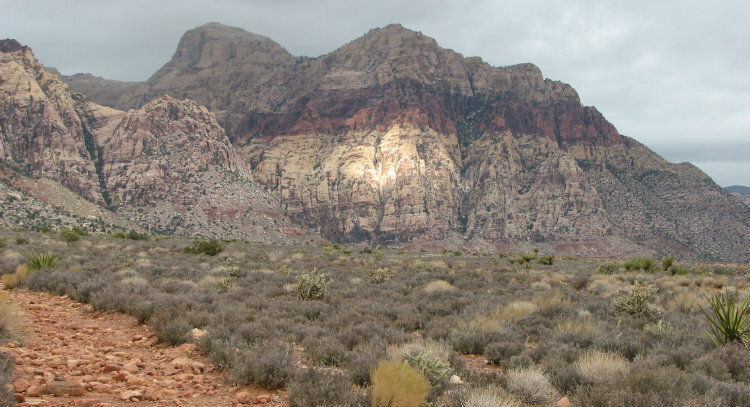 Your tax-deductible donations enable Friends of Red Rock Canyon to fund projects and services benefitting Red Rock Canyon National Conservation Area. Thank you for your support!